NASA ISS On-Orbit Status 15 January 2015. Today: External Thermal Control System (ETCS) Loop B Recovery Status: Ground teams are methodically working towards repressurizing and recovering ETCS Loop B and the systems which were deactivated as a result of yesterday's safeing response. The Loop B Interface Heat Exchangers (IFHX) are still bypassed and isolated, preventing internal heat rejection on Loop B. Due to the loss of heat rejection for the Node 2 Low Temperature Loop (LTL), half of the power loads in the Node 2, JEM and Columbus modules remain powered down. ETCS Loop A continues to operate nominally. Conjunction with Object #27317: Ground Teams are evaluating tracking data for a possible conjunction with Object #27317. The debris is small, experiences about 7 times as much drag as ISS and is reasonably well tracked. Concern level on the item remains high after several tracking updates were received. Time of closest approach to ISS is Friday, January 16th at 9:03am CST. If required, a Pre-Determined Debris Avoidance Maneuver (PDAM) will be performed at 6:43am CST. P1-2 Multiplexer/Demultiplexer (MDM) Fault: The P1-2 MDM exhibited a fault during USOS systems recovery yesterday. An internal counter started incrementing as a result of the Loob B configuration and after approximately 9 hours, the counter caused an error in the MDM. A power cycle recovered the MDM and reset the counter, however the counter resumed to increment. Later in the day, ground teams identified and sent commands that were able to reset the counter versus having to power cycle the MDM every 9 hours during the Loop B recovery period. General Laboratory Active Cryogenic ISS Experiment Refrigerator (GLACIER) 4: GLACIER 4 has exhibited some issues controlling internal temperatures. While ground teams troubleshoot the issue, Virts moved science samples out of GLACIER 4 and into MERLIN 3. Micro-5: The Micro-5 bacteria activation activity was divided into a morning and afternoon session. In each session, Virts performed the same actions using different serial number hardware. During each session, inside Microgravity Science glovebox (MSG), Virts activated the bacteria in each bacteria growth bag using the inoculum syringe. After activation, the bacteria growth bags and inoculum syringes were placed back into the bacteria kit and then that kit placed inside Commercial Generic Bioprocessing Apparatus-4 (CGBA-4) for incubation. The Investigation of host-pathogen interactions, conserved cellular responses, and countermeasure efficacy during spaceflight using the human surrogate model Caenorhabditis elegans (Micro-5) investigation aims to better understand the risks of in-flight infections in space explorers during long-term space flight using the model organism Caenorhabditis elegans (roundworm) with the microbe Salmonella typhimurium (causes food poisoning in humans). Fruit Fly Lab - 1 (FFL-1): Cristoforetti gathered and unstowed the necessary hardware and reviewed the Fruit Fly Lab overview training material in preparation for performing payload activities. The crew then installed cameras and fly cassettes into the nanoracks centrifuge and Biorack and fed the flies. In addition, the crew succesfully activated the centrifuge. The Fly Camera provides the flies with circadian lighting (day/night cycle) and allows for video recording of their development and behavior. Drosophila melanogaster, or the fruit fly, serves as a useful model organism to investigate the biological effects of the space environment. In our previous experiment we have shown that the innate immune system of the fly is affected by spaceflight. In this experiment we plan on studying what the combined effect of altered host immunity and altered microbial physiology will be in the space flight environment. Airway Monitoring: Cristoforetti and Virts set up video cameras and all hardware for the Airway Monitoring experiment planned for Friday, 16 January in the US Lab. The enhancement unit and the portable pulmonary Function System (PPFS) will be configured for a software upgrade from the ground. At the conclusion of the software upgrade, the crew powered down the Enhancement Unit and the Portable PFS. The primary goals of the Airway Monitoring experiment is to determine how gravity and microgravity influence the turnover of Nitric Oxide (NO) in the lungs. During future manned missions to the Moon and to Mars, airway inflammation due to toxic dust inhalation is a risk factor. 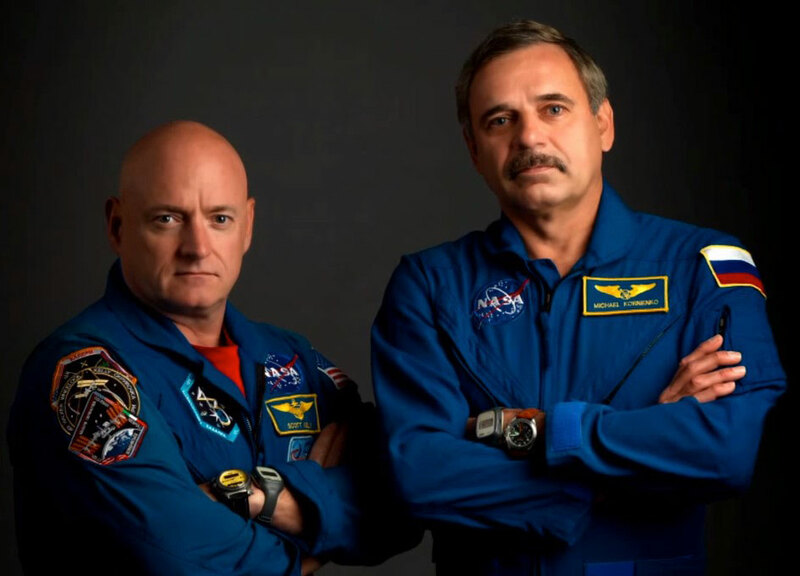 Since dust may cause airway inflammation and since such inflammation can be monitored by exhaled NO (Nitric Oxide) analysis the present study is highly relevant for astronaut health in future space programs. Nanoracks Module 9: Wilmore activated/agitated/deactivated the mixture tubes to facilitate NanoRacks Module-9 operation B experiments. Module-9 is a collection of student research projects utilizing the NanoRacks Mixsticks. The NanoRacks-National Center for Earth and Space Science Education investigation results from a commercial Science Technology, Engineering and Math (STEM) education program overseen by the National Center for Earth and Space Science Education (NCESSE), called the Student Spaceflight Experiments Program (SSEP). Student teams from across the United States design their own experiments using flight approved fluids and materials. The investigation consists of 19 different science experiments flown in a NanoRacks Module on board the ISS. Wearable Monitoring: Cristoforetti setup hardware and donned the Wearable Monitoring Vest for data acquisition during sleep. Wearable Monitoring validates a new cloth vest that monitors astronaut heart rates and breathing patterns during sleep. It collects data to investigate whether changes in heart activity are related to astronauts' poor sleep quality. Current technology cannot check astronauts' heart activity while they sleep because the test wakes them up. The Wearable Monitor is a lightweight vest with silver wires and sensors embedded into the fabric, making it more comfortable to wear. Advanced Plant EXperiments 03-1 (APEX-03-1): Wilmore configured the VEGGIE facility for initial APEX-03 operations and installed a total of seventeen APEX-03 petri plates into the VEGGIE to begin grow-out. The Vegetable Production System (VEGGIE) is a deployable plant growth unit which provides lighting and nutrient delivery and utilizes the cabin environment for temperature control and as a source of carbon dioxide to promote growth. Advanced Plant EXperiments 03-1 (APEX-03-1) continues a highly successful investigation into the effects of microgravity on the development of roots and cells on plant seedlings. The experiment photographs seedlings of Arabidopsis, or thale cress, every two hours as they grow in petri dishes. After 14 days, the seedlings are preserved for return to Earth and detailed analysis. Microgravity Research Locker/INcubator (MERLIN) Ice Brick Insertion: Virts inserted Ice Bricks into MERLIN #3 for temperature conditioning. Synchronized Position Hold, Engage, Reorient, Experimental Satellites (SPHERES) Zero Robotics Dry Run: Wilmore and Serova set up SPHERES hardware and executed a dry run for the Zero Robotics competition scheduled for Friday 16 January. The SPHERES Zero Robotics investigation establishes an opportunity for high school students to design research for the ISS. As part of a competition, students write algorithms for the SPHERES satellites to accomplish tasks relevant to future space missions. The algorithms are tested by the SPHERES team and the best designs are selected for the competition to operate the SPHERES satellites on board the ISS. SpaceX-5 Dragon Cargo Ops and BD2 Control Panel Handover: The crew continued transferring cargo from Dragon to ISS today. One of the items transferred was a control panel for the Russian Treadmill (BD2). The control panel had failed in November 2014 and a replacement was subsequently manifested onboard SpaceX-5. The part has been handed over to the Russian crewmembers. A change out of the BD2 control panel is scheduled to occur tomorrow. Over 60 hours of cargo operations will be required in the coming weeks. Remote Power Control Module (RPCM) Power On Reset: RPCM LAD11B_A experienced a power on reset overnight, which affected several Audio Orbital Replacement Units (ORUs). As a result, S-Band Space to Grounds 1 and 2 were temporarily lost. The associated ORUs have since been re-activated and Space to Ground 1 and 2 recovered. Ku-Band Space to Grounds were not affected. All activities have been completed unless otherwise noted.